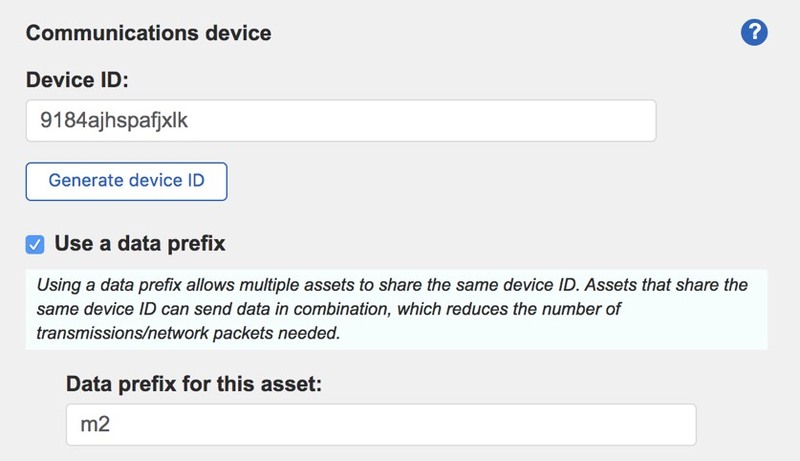 You can have a single communications device that sends data for multiple assets, or "things" in a single block of data. Let's imagine that you have one device which communicates over the internet: this may be via 4G, or it's hard-wired. This device is capable of sending (and maybe receiving) data to and from the Assetwolf platform, including the ability to communicate via MQTT and send data in JSON format. On the local side, this device has one or more assets whose data it sends. (It may also be able to receive data or commands from Assetwolf and relay these to the assets. The assets themselves may be industrial devices, sensors or other things. They only need to communicate locally (with the communications device). They don't need to be capable of accessing the internet themselves, and don't need any MQTT or JSON abilities. There can be any number of assets, and any number of fields for each one. The list of fields for each asset does not need to be the same for each asset (fields can be omitted). As with the simpler format, remember to put double quotes (") around asset and names, and around values if they are text. In this example, "9184ajhspafjxlk" is the communications device ID, and "m2" is the data prefix for the asset.